you would find in a flashlight. And here is the wiring layout for our 48 volt system. The above drawing represents one of the battery banks we have here. wired for a 48 volt system. This keeps the voltage the same but increases the amp hour capacity. 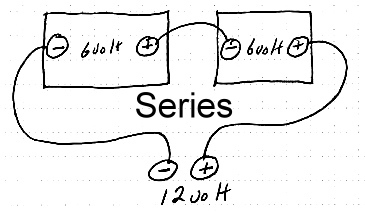 And then we have a series/parallel setup. 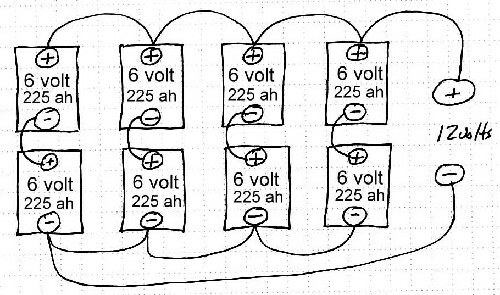 This increases both the system voltage and the amp hour capacity. 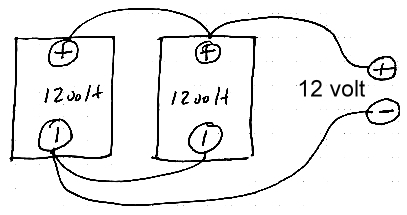 wired in series/parallel for a 12 volt system. As a note: The above 12 volt battery bank has the same type and number of batteries as our 48 volt system. It stores the same amount of energy but delivers it in a different manner (voltage and amperage).